Arjuna Ratha shares the platform with the Draupadi ratha, however, it differs from the former in various aspects. The large common platform (jagati), reached by a staircase, is supported on alternating lions and elephants. Above the platform is the adhisthana (base) of the Arjuna ratha, comprising of various architectural elements. This adhisthana is also reached by a small flight of steps. The ratha measures 11.5 feet by 16 feet with height reaching to 20 feet. The ratha is consisted to a narrow front mandapa followed by a square sanctum. The entrance to the mandapa, facing west, is supported on two pillars and two pilasters. The pilasters have seated lions for their base. The pillars are modern and Longhurst1 tells that those are placed to provide an additional support as the mandapa had been cut away to an alarming degree. The beam above has a frieze of ganas. The cornice above the beam has six kudu (chaitya-arches) arches, each having a peeping human head inside. Above this cornice rises two stories of the vimana, placing the ratha in dvitala temple category. On each side, of both the stories, are two square shrines at the corners and one oblong shrine in the middle. These shrines are interconnected with cloisters. The arrangement of the shrines resembles the similar decoration found above the cornices on many cave temples in Mamallapuram.. The first story has an empty cell facing west. There are total of eight niches around this cell. These niches are adorned with various couples, carved till their waists, who according to Nagaswamy2 may represent the asta-dikpalas (eight directional guardians). A visitor cannot reach this first story, as there is no staircase provided. Niches are provided all around the ratha at the ground floor and various figures are adorning these niches. There are five niches on each side. Of each side, two niches at extreme ends are decorated with dvarpalas. In the central niche on the northern side, a male figure is shown with an attendant. The male figure has four hands and probably holding a chakra (discus) and shankha (conch) in his upper hands. Longhurst1, Sivaramamurti3 and various other scholars identify him with Vishnu and Garuda however Nagaswamy (49) identifies him with Shiva. Identification with Vishnu seems to be appropriate here. The niche on the right of this central niche is unfinished. While the niche on the left has a couple. The central niche on the eastern side shows a male rider over an elephant. Elephant is a mount of Indra as well as Subramanya. Longhurst, Sivaramamurti take this figure as Indra while Nagaswamy takes him as Subramanya. One of the argument in support of Indra may be that the figure faces east which is also that direction Indra guards in his role of dikpala (guardian of directions). Two ladies are found on one adjacent niche, while a bearded man and a child is shown on another adjacent niche. The ladies, in the adjacent niche, have been highly praised for their beauty and charm by various scholars and visitors alike. The terminal niches has dvarpalas, one holding a bow and bearing a thread made of human skull while the other is stahding with one hand on his thigh and another hand raised in adoration. Susan Huntington4 tells that if the figure is to identified with Indra, we miss the characteristic weapon of his, Vajra (thunderbolt). 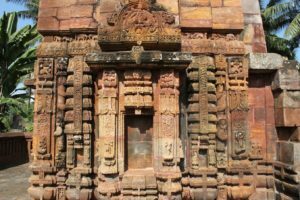 If the figure is to identified with Subramanya, then the two ladies in the adjacent niche may be identified with the two ladies who were possessed. The bearded male on another adjacent niche may be identified with Velan who was called to relieve the two possessed ladies. In another interpretation, the two ladies may be taken as the two wives of Subramanya. Huntington proposed a new identification of the figures in these niches. She tells that the elephant rider is Aiyanar-Sasta, who is only known to south India. He is usually depicted riding a horse however is also associated with elephants. Aiyanar is said to be the son of Shiva and Mohini, a form of Vishnu. He is therefore also referred as Hariharaputra. He has two wives, Puranai and Putkalai (alternatively Madana and Varnani). The bearded man would be the sage Damanaka and the child would be Satyaka. Damanaka was the chief attendant of Aiyanar and Satyaka was his son. It is also known that Damanaka had a deformed body. On southern wall, the central niche has Shiva as Vrashbhantaka-murthi, leaning on his bull, Nandi. On the either side of this niche are shown two couples, one in each niche. Minakshi2 suggests that one of the couple represent Pallava king Rajasimha and his queen. The sanctum, at present, is devoid of any emblem. Longhurst, while clearing the plinth of the raths, reported finding of a broken head of Shiva and the finials of Arjuna and Draupadi ratha. On the basis of this head, he suggests that the Arjuna Ratha is dedicated to Shiva. Deriving further on this, Longhurst tells that these kind of trident heads were setup in place of lingas thus constituting a peculiar custom of the Pallavas which doubtless indicate to some special Shiva cult being followed in that period. As per him, the horn-headdress worn by some dvarpalas further attests this special cult. 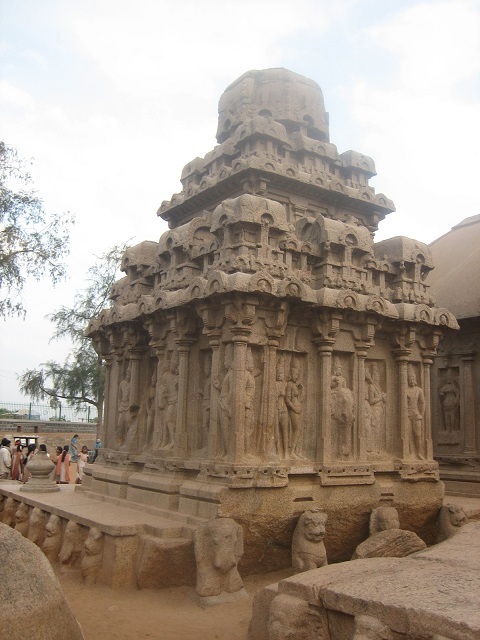 Nagaswamy, on the basis of the figures on its external walls, also of opinion that the ratha was dedicated to Shiva. At the back of the ratha, on the east, is a figure of bull which may represent Nandi. This is irregular that instead of finding Nandi in front of the sanctum, we find it at the back of the temple. One assumption would be that the artists did not find a suitable boulder in front of the temple, however in that case, they may have changed the entrance of the ratha from west to east. As this was not done, it may be said that carving this bull was an afterthought once the Ratha was already hewn out.